During the APEC Group of Friends of Disabilities symposium (GOFD), the Patron of the Papua New Guinea Assembly of Disabled Persons (ADP) and wife of the Host Economy’s Prime Minister, Mrs Lynda Babao O’Neill said that Papua New Guinea is broadening its support to ensure there is inclusion for the disabled community to expand.During the APEC Group of Friends of Disabilities symposium (GOFD), the Patron of the Papua New Guinea Assembly of Disabled Persons (ADP) and wife of the Host Economy’s Prime Minister, Mrs Lynda Babao O’Neill said that Papua New Guinea is broadening its support to ensure there is inclusion for the disabled community to expand. “We are expanding our programs and support, and we know that we have an ongoing huge task before us. “We need to enhance understanding not only in government but in business institutions and the general public. “We need businesses to create jobs that enable more people with opportunities to enter the workplace,” said Mrs O’Neill. 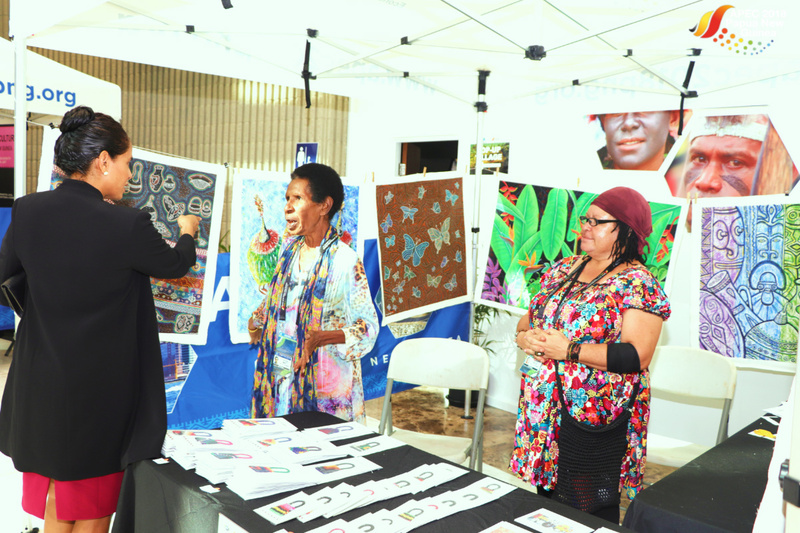 The Micro, Small and Medium Enterprise (MSME) exhibition during the APEC Second Senior Officials Meeting (SOM2) in Port Moresby has provided an opportunity for a local artist to promote her business. Winnie Weoa of TAPS Fine Arts is an example of a Papua New Guinean that creates traditionally inspired PNG paintings. She is the sole owner of the business that produces all her artwork from the comfort of her own home said she began her business in 2005, specializing in dot paintings, and has since expanded into more sophisticated traditional PNG artwork. Weoa was born with a hearing and listening impairment but her disability has not stopped her from pursuing her passion for art and turning it into a profitable business. She attends weekly markets to exhibit and promote her small painting business. Although she has not received much support from the government, she hopes that showcasing her business during the APEC meetings will allow for her to gain some exposure, both domestically and internationally. Mrs O’Neill who officiated during GOFD visited TAPS Fine Arts stall at the MSME exhibition purchased one of Weoa’s painting of traditional East New Britain Duk-duk dancers that caught her attention and said that through Forums like this, barriers can be removed, rights can be made real through Digital Age.